Being fortunate enough to join up with friends on a sea journey cruising by Dania, Hollywood, North Miami, Downtown Miami, Key Biscayne and Crandon Park is KING! The opportunity was spontaneous, spur of the moment. But, it was by boat. And, nonetheless, exciting. I met up with the rest of the gang toting my bag of portable gear at a dock close by. Packed up and en route, via the channel at Port Everglades. 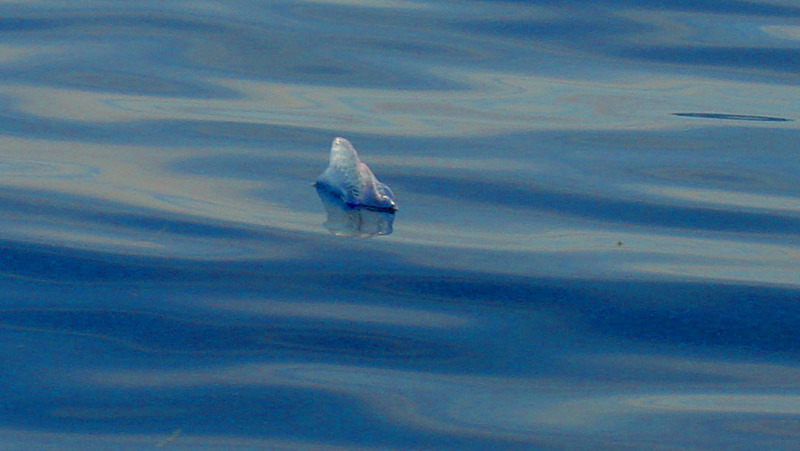 In the ocean, we came upon hundreds of Portuguese Man-of-War blowing in towards shore. Our Captain explained that sea turtles lived off of them. Coincidentally, I thought I saw a big turtle, very briefly. I found the man-of -war to be very intriguing. Their name is derived from the the sail of the upper quadrant of their vessel-like bodies. Which resembled the sails of Portuguese War Ships. Hence the name: Portuguese Man-Of-War. Subsequently, those sails were blowing the interesting sea creatures right onto the entire southeastern shoreline. These creatures can severely sting an unsuspecting human swimmer with their long, underwater tentacles if skin contact is made. There are people who have sensitivity to the allergens and, have gone into Anaphylactic shock. Which can be a devastating experience in itself. No need to go there. 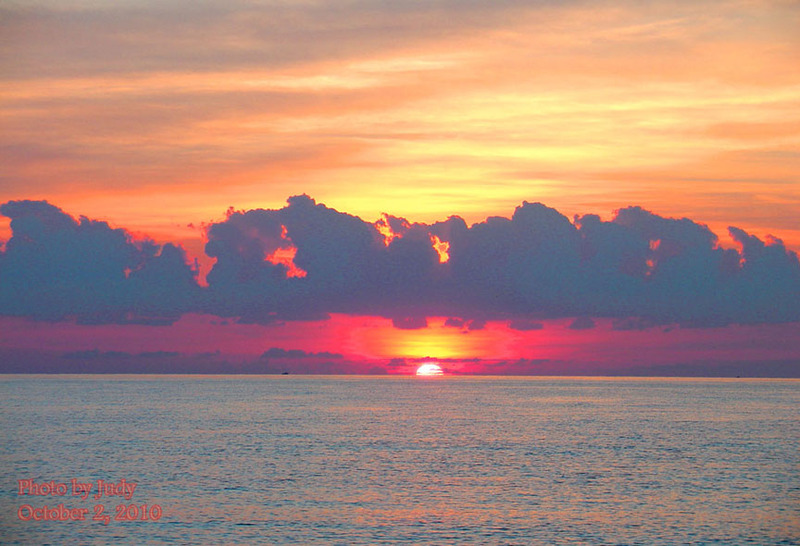 But, the coasts of Florida have beauty that never ceases to amaze me. Continuing on our journey south we came upon Miami at Sunset. I cannot describe in words the beauty of approaching Miami in the direction of the lowering sun. We were hypnotized by the sun’s beam, as we progressed closer and closer to downtown Miami. Just past the downtown area, we came upon beautiful Key Biscayne. I managed to see some dolphin. No pictures, though. The dolphin were too far away. And, it was getting dark. Yet, the visuals were a lovely scene now etched into my memory. I continued to see dolphin throughout our time in Biscayne Bay. It was glorious. This experience was so unique for me. I am fortunate to have the gift of flexibility; accepting the “here and now” as we know it. And, even more fortunate to have a wonderful camera that is capable of communicating compelling photography in the raw. 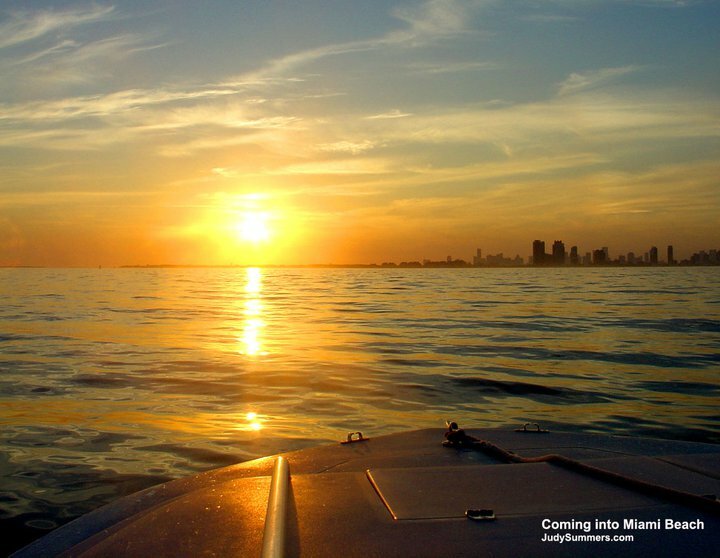 Coming into downtown Miami at sunset is a site never to be forgotten. Biscayne Bay offers its own beautiful show. Nature’s finest production.